Should I Join A Birthday Girl Gifting Circle? - Women and Money Inc.
« Entrepreneurs: Should you work from home or rent an office? Should I Join A Birthday Girl Gifting Circle? Recently I met with a couple to do their bankruptcy counselling, and as we were talking the wife asked me a very interesting question. She asked my opinion on joining a “gifting circle” after being invited to do so by a close friend. The buy-in was $5000, and the promised reward was $40,000. My first response was — that sounds like the “Birthday Girl” scheme. She said “Yes! That’s what they call it, the ‘Birthday Girl’ gets the money when it’s her turn”. Oh boy. Here’s a very intelligent woman in the midst of a business-driven bankruptcy, who can ill afford to lose 5 thousand dollars, considering joining this “circle” with her friend. She said there were a number of women joining this circle and she was worried it was not legitimate. I explained to her why she should be worried. 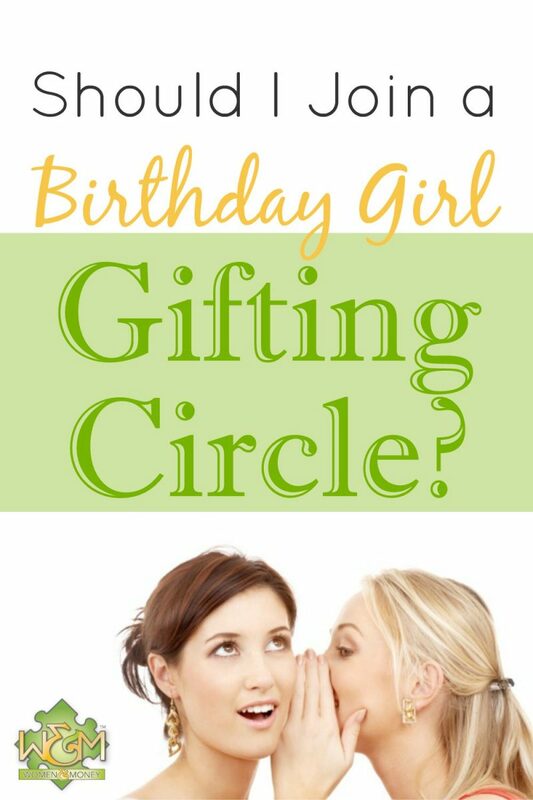 Let me explain the concept of the “Birthday Girl” style “Gifting Circle”. There are 15 members, placed into four tiers as such: 1, 2, 4, 8. Each member of the outer circle (bottom 8) pays $5000 to enter, as their gift. That money is gifted to the Birthday Girl, the one in the top tier. After the “Birthday Girl” has her turn, she exits the top tier, and may (or may not) “buy” back into the bottom tier of 8 buy gifting $5000. Everyone else moves up a tier by splitting the group into two groups. The 2 from the second tier now are the 1 in the top tier of each group A and group B. The original 4 in the third tier become 2 in group A and 2 in group B. The 8 move up to the 4 positions in the third tier. And now they must recruit 8 new members for each group A and group B to keep the money coming to gift the next “Birthday Girl”. As you can see, this rotation requires an infinite addition of new members, at an exponential rate, to sustain itself. Is that sustainable? I don’t think so. You’ll also notice the real structure of this “gifting circle” is not a circle at all. Actually, it looks like a pyramid wouldn’t you say? A serious concern with the “Birthday Girl” gifting circle is it’s unsustainable, and therefore both unethical and illegal, because eventually growth will cease and people will lose money. Their gift will not be returned let alone multiplied. The RCMP advise this is criminal activity under Section 206(1)(e) of the Criminal Code, which lays out the elements of a pyramid scheme offence and how one may be prosecuted criminally simply by virtue of participating in the scheme. A huge red flag is there are no written documents, no agreements, no contracts, nothing signed, nothing to produce when and if you are trying to get your money back – or find it. Further alarming is the fact that you never know the true identity of all the women that you are dealing with. They use fake names and email addresses – in addition to the meeting being held in “secret” locations. Here’s another concern: these groups prey on women desperate to increase their “abundance” with a flawed concept of the abundance mentality. Abundance mentality is about giving without expectation of receiving, and confidence that God/The Universe provides abundance for all. But this “Birthday Girl” gift circle is emphasizing the birthday gift, the expectation of a return. And that gift can only be created by “receiving” money from other women. Fluffy frou-frou language about empowering women, creating abundance and spiritual healing is used to convince women to join, as well as the promise of receiving a birthday gift in return. Why do these women think money must be spent to create spiritual healing and feminine connection? Nothing could be further from the truth! There may be other structures of gifting circles which truly are circles (no tiers, no inner rings, all are equal). They may emphasize the gift has no monetary return, or they may include a fair gift exchange between members. However, I have seen no hard evidence of these circles. I warned my client of the history of the “Birthday Girl” scheme and she is now immensely grateful she didn’t jump into it. If you are considering joining one of these “circles” please, please do your homework. Be very careful that you completely understand what a gifting circle group is all about, before becoming a member. Even then you may never see your money again and as for bringing in a friend… you may have helped your friend to lose their money too – making you feel even worse. Don’t be pressured by family or friends to join a group that isn’t right for you. If you have been the “victim” of a “Gifting Circle or Birthday Girl scheme” please send us an email – we would love to hear your story and share it with others. This entry was posted in Women and Money. Bookmark the permalink. Both comments and trackbacks are currently closed. I have been approached to join a gifting circle. I actually thought those scams had disappeared a long time ago, but apparently not. I was appalled by the person’s naivety to the blatant pyramid scheme that it really is. I am involved in the Network Marketing profession, which is often tarnished by the same brush by uninformed people. So my antennas went up immediately. Great article … stay away! Hi Janice, yes unfortunately this scam is still going on. Absolutely when the money only comes from recruitment that is a giant red flag. Thank you for clarifying the difference between a scam and a legitimate network marketing scenario!